This is my first Software Development update after the first TOFFEE-Mocha x86_64 and Raspberry Pi release. I got few emails from various users across the world for few new feature requests. Today I got a feature request from Jonathan Withers. Jonathan is from a company called MultiWave Australia. He said he is able to get the TOFFEE-Mocha Raspberry Pi setup up and with that he is able to emulate geostationary satellite link. But he requested me is there a way to extend the constant packet delay from 40mS to 500mS. 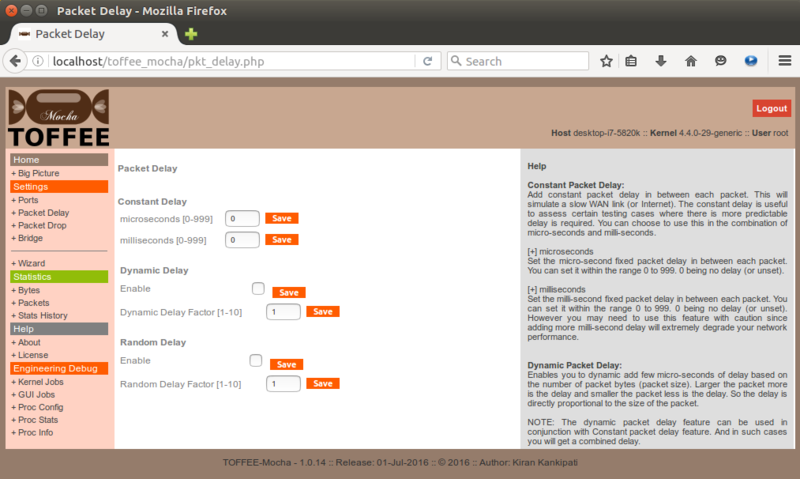 So as a part of his request I supported the same in the current ongoing development version of TOFFEE-Mocha. Apart from this I supported a new feature called Random Packet Delay feature. With this feature if enabled, users can skip packet delay of few packets. This can be extremely useful in case if you want to simulate any bursty dynamic network packet flow. The probability of the same can be controlled via Random Packet delay factor variable. If it is set value 1, more and more packets may skip packet delays (both constant and random), and if it is set to value 5, 6 or 10, then the probability of skipping delays will reduce. You can use this setting in combination with packet delays and packet drop features. Random packet delay also may simulate a sort of buffered packet flow. Sometimes due to packets getting accumulated in network device buffers few tend to arrive faster than others. Although the entire network link speed is governed by the overall physical layer technology such as wireless, or wired, copper vs fiber, etc. We can see this behaviour in a simple ping test. Few packets tend to arrive faster than others. And it is highly random and unpredictable the exact response time of each ping packet. A Random packet delay feature will contribute this effect in a pure WAN simulation link built with TOFFEE-Mocha.